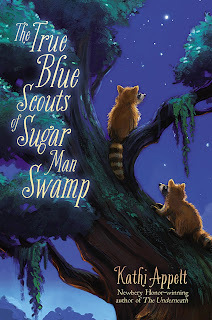 Kathi Appelt is the author of The Underneath (a fantastic book) and the newly released The True Blue Scouts of Sugar Man Swamp. I was fortunate enough to get the chance to interview her for her blog tour. If you haven't picked up a copy of this book yet, definitely do so! It's a beautiful book, from the writing to the cover! TCR: Who was your favorite character (or characters) to write in The True Blue Scouts of Sugar Man Swamp? KA: I loved writing the Scouts, particularly J’miah. I’m a worrier, and he is too. So he appealed to me at a personal level. Both of us also tend to squint. TCR: What was the hardest part about writing the book? The easiest? KA: The hardest part was really figuring out who Chap was. I had all of the other characters in place, but Chap eluded me for quite a long time. The easiest was writing about the hogs. They were so rip-roaring that I found myself having a whole boatload of fun. TCR: I recently spotted a finished copy of novel in a friend’s hands, and it is a beautiful book! What was your reaction when you saw the cover? KA: I love that cover. My reaction was a grin from ear to ear. And be sure to watch the adorable book trailer! Kathi Appelt is the author of the Newbery Honor-winning, National Book Award finalist, PEN USA Literary Award-winning, and bestselling The Underneath as well as the highly acclaimed novel Keeper, The True Blue Scouts of Sugar Man Swamp, and many picture books. She is a member of the faculty at Vermont College’s Master of Fine Arts program. She has two grown children and lives in Texas with her husband. 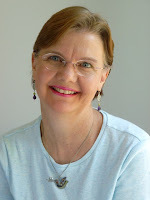 For more information, visit her website at http://www.kathiappelt.com/.